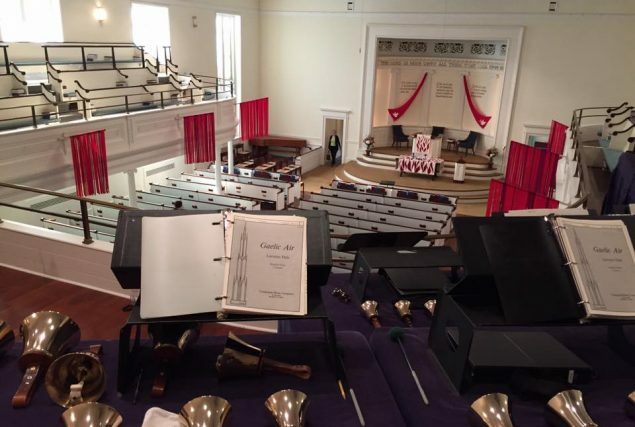 The bell choir's view from the Choir Loft as they prepare for Pentecost 2016. Instrumentalists frequently share their gifts in our worship services by providing prelude and offertory pieces and accompanying the choirs. Our church is blessed by a wide community of musicians, and we welcome all levels of ability and experience, from young to old. Two handbell choirs, Nassau Ringers I and II, continue in Nassau’s long tradition. The choirs play six to seven times per year in worship and visit a local retirement community or nursing home once per year. Open to open to youth (high school) and adults. Rehearsals are Thursday evenings. Download the Handbell Choirs 2018-19 Schedule (pdf). New members for both groups are always welcome. Come ring with us! Princeton Presbyterian Quartet (PPQ) is made up of members of Witherspoon Street Presbyterian Church and Nassau Presbyterian Church, as well as area musicians. Consisting of both amateurs and professionals, this ensemble presents music in worship at both churches four to five times per year. Open to adults, college-age and older. The instrumentation for each performance is flexible to accommodate the availability of particular players.